Looking for suggestions for a trip? Something different is a visit to Flame – the only gasworks left in Ireland. 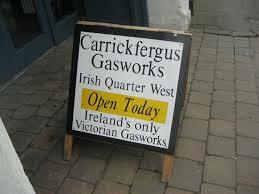 It is maintained by the Carrickfergus Gasworks Preservation society and, as well as information on how gas was produced, it also has a large display of gas appliances – cookers, fires, etc. The visit is free though a contribution towards costs is appreciated. For details see Flame .